Anyie (left) delivering his speech at the ‘Nguling Tikai’ in Rumah Benang Paling near Beluru Town on Saturday. Seen on 7th right is Penguang and political secretary to the chief minister Alexander Asing (8th right). BELURU, Marudi: Anyie Ngau, the current Baram MP is leaving his political future to the BN top leadership to decide. As such he will abide by the decision of the BN top leadership whether he will be fielded or otherwise in the 14th General Election. “I leave it to the top BN leadership to decide on my candidacy for the coming 14th general election. But I hope the top BN leadership especially my party, Progressive Democratic Party (PDP) will give me another chance to continue serving the people here,” Anyie told BAT 7 at the ‘Nguling Tikai’ at Rumah Benang Paling here on Saturday. However, he stressed that even if he were not chosen, he would support the BN candidate to ensure that the BN continues to represent the people in Baram. “As a BN man, I will support whoever the BN will pick as its candidate and I’m duty-bound to ensure that he can deliver for the ruling collation,” said Anyie, who is a first term MP of the area. On another note, he advised the people in Baram to continue to support the government as it is a futile effort to support the opposition which will not be able to bring the necessary funding to develop the vast Baram area. 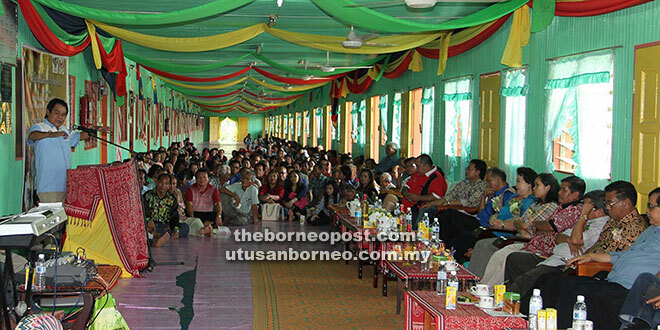 When asked to comment on Anyie, Marudi assemblyman Datu Dr Penguang Manggil said all the three assemblymen in Baram hoped that the BN top leadership would give Anyie another chance to serve the people. “He is a nice man and he is a team player especially in our efforts to upgrade Baram into a division,” said Penguang. Besides Marudi, two other state seats under the Baram parliamentary constituency are Mulu and Telang Usan which are PBB seats. “And rest assured that ‘Team Baram’ which consists of the three assemblymen in this area will give him all the support that he needs,” said Penguang. The Assistant Minister of Local Government also assured the top BN leadership especially PDP that his Baram Team has also ready its ‘Plan B’ in case Anyie is not re-nominated. “We are also ready in the event that the top BN leadership decided to field a new candidate for Baram. He is here present with us and he has been moving around on the ground too,” revealed Penguang. He also reiterated that the ‘gentlemen agreement’ in Baram would continue to be kept that if Marudi assemblyman is an Iban; Telang Usan assemblyman is a Kayan, and newly created Mulu seat is allocated to the Kelabits, then the MP would be from the Kenyah community. Meanwhile, PBB Long Lama branch chairman Wan Anyie said the BN top leadership should allow Anyie to continue to be given the chance to serve the people in the area. “We need continuity here in Baram. So we cannot afford to keep on changing our MP. As Anyie is only a one-term MP, I think he should be given the chance to continue as he’s also winnable candidate,” he stressed. Wan also revealed that if Anyie were to be re-nominated then PKR Baram deputy chief Roland Engan would not challenge him as he (Roland) had made a promise not to challenge his own uncle again if he (Anyie) were to be re-nominated. In the last polls, Baram saw a three-cornered fight between Anyie, Roland and Patrick Sibat (Independent). Anyie garnered 9,182 votes to Roland’s 8,988 and Patrick’s 363.